Mu (Monotaxis grandoculis) | Better Know a Fish! 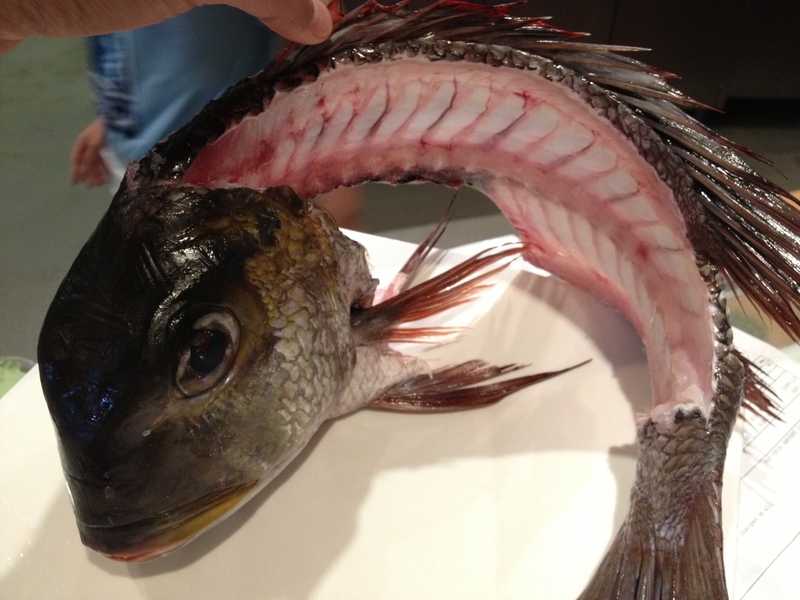 My good friend Len and I stopped by our favorite Japanese restaurant last week, and whilst chatting with the chef, we were treated to the sight of this fabulously expressive fish head. We just got this in from Hawaii, the chef said. Showing us the invoice, the chef asked Len if he knew how to pronounce the name of this fish, knowing that my friend often visited relations there. My friend and I looked at the crumpled sheet of paper: 6lbs, mu’u, display. A phone call was made to Hawaii for a second opinion. 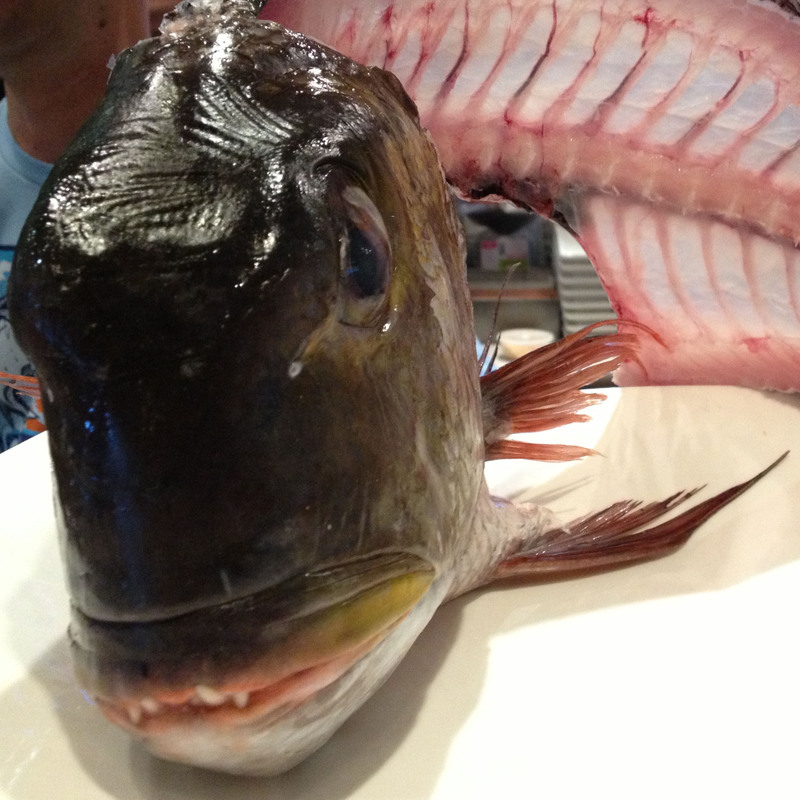 I asked the chef if I may examine the fish close-up. I stood half-way up on my bar stool to take better photographs. The commotion caused my fellow diners to look on with curiosity. The fish sat still, frozen with the exaggerated gaze of a kabuki actor. Mu-u, or mū, is the Hawaiian name for Monotaxis grandoculis, variously known as the bigeye emperor or humphead bigeye bream. Resembling a porgy with its snaggled grin and shell-crunching molars, mū belong to a related family, Lethrinidae, popularly known as the emperors. The mū in our possession would appear to be one of average size, about 15 inches (40 cm). Mū feed on sea snails, brittle stars and sea urchins on coral reefs in Hawaii, westward to East Asia and northern Australia, continuing into the Indian Ocean and the Red Sea (Carpenter and Allen 1989). One young specimen was sighted in Turkish waters, possibly having made its way through the Suez Canal and into the Mediterranean Sea (Bilecenoglu 2007). Adult mū can be found in a dark-colored form or a light-colored form. When harassed, both forms have the ability to quickly revert their colors to dark, saddle-like patterns, a throwback to their more striking colors as juveniles (Carpenter and Allen 1989). [They] are an odd fish, almost like cows of the shallow reef, the way they gather in groups and wander about. They have an interesting tendency to hover, almost motionless, over the reef. If you try to approach them they magically drift away, keeping the same distance, yet do not appear to move at all. It is like they are levitating. …like oo in moon… vowels marked with macrons are somewhat longer than other vowels and are always stressed. Carpenter, KE, GR Allen. FAO species catalogue. Vol.9. Emperor fishes and large-eye breams of the world (family Lethrinidae). An annotated and illustrated catalogue of lethrinid species known to date. FAO Fisheries Synopsis. No. 125, Volume 9. Rome, FAO. 1989. 118p. Kawena Pukui, M, SH Elbert. Hawaiian dictionary: Hawaiian-English, English-Hawaiian. Honolulu: University of Hawaii Press, 1986. 600p. This entry was posted in Actinopterygii, Marine Fish, Perciformes and tagged bigeye emperor, emperors, foodfish, gamefish, humpnose big-eye bream, Indian Ocean, Lethrinidae, Mediterranean, mu, mu'u, mu-u, Pacific Ocean, Perciformes, yokoshima kurodai. Bookmark the permalink.